My, what a wonderful night! 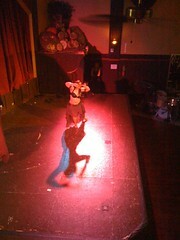 On March 26, 2011 Bridgetown Fashion Revue debuted at the Alberta Rose Theatre. We had a great time. It was an honor being a part of this fantastic show. Photos by Circle 23. Models are Grace Constantine, Endymienne and Henna. MUA: Miky Solares. Accessories by Vauntville. Whew. I’m tired but happy. It’s been a busy, exciting and productive month in SCC land. There are piles of patterns and fabrics on every surface in the studio, with tax documents also commanding attention from their prime spot on my desk. Recently, my models for Bridgetown Fashion Revue came over for a fitting. I think we all had an enjoyable time amidst playful cats attempting to steal the measuring tape. And hey, guess what! While we’re on the subject of the BFR show, Brandy of Vauntville will be making some special pretties for our show. If you haven’t seen any of Brandy’s gorgeous creations yet, make haste and follow the link. Welcome to the team, Brandy! So, even though life and business couldn’t be more chock-full of awesomeness, oftentimes I am feeling a little starved for well, belly dance. Working 12 hour days as a one woman operation, I find it incredibly challenging to make it to a dance class or performance. In honor of all workaholics out there, I thought I would share a couple of sources for staying connected (and entertained) while plugging away at your dreams. What? A belly dance reality show? Yep.